The Goolix (ミズモチ?, lit. : "Water Rice Cake") is a watery boss in the first Pikmin game; on approaching its location, it emerges from the ground. It resembles a blue amoeba with two nuclei (a blue one and a larger yellow one). It stretches around to engulf Pikmin who happen to be in its path and drowns them out with its aquatic properties. The only Pikmin invulnerable to it are Blue Pikmin, due to it being composed mostly of water. It is only found in The Impact Site on odd-numbered days starting from day 9 (even-numbered days starting from day 8 will have the Mamuta instead). The Goolix remains invisible and is inactive until the the Captain or a Pikmin approaches its area. When this happens the creature will reveal itself, scattering any nearby Pikmin. When active, it will slink around, aiming for the Captain. It has no specific attacks, but its touch will damage Olimar and cause any non-blue Pikmin to suffer from the water effect. Only blue Pikmin can penetrate the Goolix's membrane and attack one of its two cores. When under attack, the only threat the creature poses is flinging Pikmin from it, possibly causing them to lose their flowers or buds. Once defeated, the Goolix will dissolve and leave no salvageable corpse, rather four 5-Pellets. Its large, yellow nucleus is completely impervious to damage, while the smaller, blue one can be pummeled by Blue Pikmin. The Pikmin can damage the Goolix this way, but the process takes a long time. During the battle, the creature will attempt to chase after Olimar, but will be limited if Pikmin are hitting on its small core; the more Pikmin attacking, the less it can move. Once the Goolix is stretched out, the two cores can be made to snap against one another, which causes a good amount of damage to the Goolix. 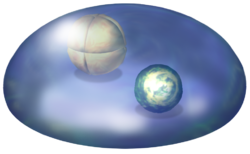 There are two ways to make the core snap: either whistle the Pikmin attacking the small core, which will make it bump against the large core, or throw a Pikmin directly on top of the large core, which will make it clank against the smaller one. Of course, the more stretched out the Goolix is, the more violent the collision between nuclei, and the more damage the creature will suffer. The more Pikmin are attacking the small nucleus, the more the Goolix has so stretch out to reach the leader. Every time the nuclei smack together, the Pikmin involved will be tossed all around, so be ready to call them back. When it is defeated, its membrane breaks and its watery insides spray out in all directions, leaving no trace it was ever there, besides dropping 4 random colored 5 pellets. If the Goolix is near the right of the tree-stump arena and the yellow, brain-like nucleus is hit by a Blue Pikmin, that Pikmin, or the other Blue Pikmin that are attacking the smaller, blue nucleus may be knocked into the out-of-bounds, forest like terrain. Many things can happen when this occurs, either the Pikmin will slide around (throwing Pikmin onto this ledge reveals that it's slippery, as the Pikmin will slide off) and then fall off the ledge and into the area with the Pearly Clamclamps or where the Main Engine was, or they slide too far for Olimar to call back (some will even continue sliding until they are off-screen and then will die). These Pikmin will be left behind unless you reset the day. The name "Goolix" could've come from the word "goo", referencing its slimy liquid nature. The Japanese name, ミズモチ? translates to "water mochi". A mochi is a Japanese rice cake, and marumochi in particular is a round variety; the creature's shape while idling resembles a marumochi. Internally, the creature's name is slime, further justifying the English name's origin of "goo". Blue Pikmin fighting the creature. Goolix in the Enemy reel, shown erroneously on The Forest Navel. Olimar's sketch of a Goolix in his voyage log. When not in motion, the Goolix has almost the exact same proportions as a nectar or spray drop. In the enemy reel, the Goolix is in The Forest Navel instead of the usual The Impact Site. This may be a clip of the game when it was still in early development. This enemy is the only way to see Pikmin choking with a water bubble in the first game. This page was last edited on January 27, 2019, at 14:51.